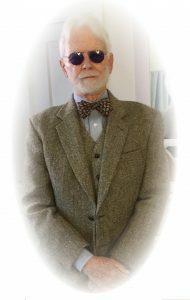 Geoffrey was a strong believer in encouraging traditional and non-traditional life-long education, which he did for a total of 48 years of his life. He received his BA in Anthropology and Philosophy, MA in Sociology, and Ph.D. in Sociology from the University of California, Santa Barbara (UCSB). Starting in 1970, he became the first Ombuds at UCSB. On May 1, 2018, the Chancellor at the University of California, Santa Barbara notified staff and students and had the campus flag flown at half-mast on May 2, 2018, to honor Geoffrey’s 30+ years of service to UCSB. “It is with regret that we note the passing of Geoffrey Wallace, long-time instructor in our Social Sciences Department. Geoffrey came to Cuesta in 2009 and was a positive influence and role model for so many students. He had most recently worked closely with many of our North County CaFE students who were Sociology majors, always encouraging them to stay strong and keep moving forward in their education. 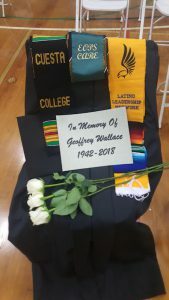 We acknowledge Geoffrey’s commitment to student success and Cuesta College, and share our deepest condolences with his friends and family. He will be missed. Geoffrey Wallace’s absence was noted at the May 2018 commencement with a reserved seat in his name.” The memorial seat is pictured to the right. Published in 2013 in the Journal of the International Ombudsman Association, Volume 6, Number 2, 2013, Tom Sebok, Ed. Pioneering Contributions: Geoffrey Wallace was among the first individuals hired to serve as ombudsman on a campus of the University of California. While still a Ph.D. student in Sociology at the University of California at Santa Barbara (UCSB), he took graduate seminars – and much inspiration – from one of the world’s leading scholars on the ombudsman concept, political science professor Stanley V. Anderson. This makes him one of the only – if not the only – University Ombudsman to be introduced to the concept by one of the leading scholars in the world. Wallace is among a small number of individuals to serve in the same university ombudsman role for over 30 years (1970 to 2004). One of his most enduring pioneering achievements was collaborating with Don Hartsock and Bill Schatz to start the annual meeting of the CCCUO at the Asilomar Conference Grounds in Pacific Grove, CA.. Impetus for Starting the Office: Riots, the National Guard, sharp shooters, a fatality, a bank burning to the ground, and three campus closures were among the factors affecting the decision to create an Ombudsman position at UCSB. Wallace said, “The Chancellor (Vernon Cheadle) was a biologist and he knew that things happen incrementally . . . You won’t take all (these problems) away by decree that you’re going to tenure all the lefties who can’t write. You can’t tell students that they’re always right. He decided that incremental change actually leads to essential change.” According to Wallace, Cheadle believed “. . . we should have more table work and less rock throwing.” And, Wallace remembers, “We had a lot of rock throwing, and buildings burned, and a bomb killed the janitor at the Faculty Club . . .” So, Cheadle was a strong supporter of the Ombudsman concept; which meant a great deal to Wallace as a new Ombudsman. Wallace spent a great deal of his initial time in the job assisting with faculty disputes. He said this was quite important in order for him to establish legitimacy with faculty. And, he did unconventional things. For example, rather than simply meeting people in his office he would also “go to people” in an effort to “understand intimately” their concerns and points of view. He described observing conversations in which “everybody was shooting high shots at each other and posturing . . .” He would sometimes find, “. . . very sophisticated people acting very poorly.” Much of his early work was dealing with “polarized faculty.” By listening he discovered he could often “get to the bottom of it” and help people work out their differences. And through it all, the lessons he had learned from Stanley Anderson about the importance of offering respect to everyone began to pay off. Geoffrey preferred to stay behind the scenes, to preserve confidentiality, in the majority of cases that he handled over the years. Nevertheless, when it was necessary to speak out against injustices, he would. Here is one sample, where he used his expertise as an Ombuds to expose fallacies brought up by the Ombudsman for National Public Radio (NPR) in 2013. The Executive Summary contains the major points.